“Introductory textbooks are supposed to give you simplified versions of the models that professionals use in their own work. The blogosphere is a realm where people from a range of backgrounds discuss current issues often using simplified concepts so everyone can be on the same page. I am somewhat surprised by Peter’s statement that the AS-AD framework is never mentioned on the econ blogs. That could indicate that Peter has never read my blog (no offense taken – I never read Peter’s blog before either). My regular readers would of course know that I am quite fund of using the AS-AD framework to illustrate my arguments. Other Market Monetarists – particularly Nick Rowe and Scott Sumner are doing the same thing quite regularly. See Nick’s discussion of Peter’s post here. The purpose of this post, however, is not really to discuss Peter’s critique of the AS-AD framework, but rather to show the usefulness of the framework with a example from today’s financial news flow. Furthermore, I will do a Market Monetarist ‘spin’ on the AS-AD framework. Hence, I will stress the importance of monetary policy rules and what financial markets tell us about AD and AS shocks. Over the weekend we have seen large street protests in Istanbul in Turkey. The demonstrations are the largest demonstrations ever against the ruling AKP party and Prime Minister Erdogan. Mr. Erdogan has been in power for a decade. The demonstrations today triggered a 10% drop in the Istanbul stock exchange so there is no doubt that investors think that these demonstrations and the political ramifications of the demonstrations will have a profound negative economic impact. I believe a core insight of Market Monetarist thinking is that financial markets are very useful indicators about monetary policy shocks. Hence, we for example argue that if the US dollar is depreciating, market inflation expectations are rising and the US stock market is rallying then it is a very clear indication that US monetary conditions are getting easier. While the focus of Market Monetarists have not been as much on supply shocks as on monetary policy shocks (AD shocks) it is equal possible to ‘deduct’ AS shocks from financial markets. I believe that today’s market action in the Turkish markets are a pretty good indication of exactly that – the combination of lower stock prices, higher bond yields (higher risk premium and/or higher inflation expectations) and a weaker lira tells the story that investors see the demonstrations as a negative supply shock. It is less clear whether the shock is a long-term or a short-term shock. 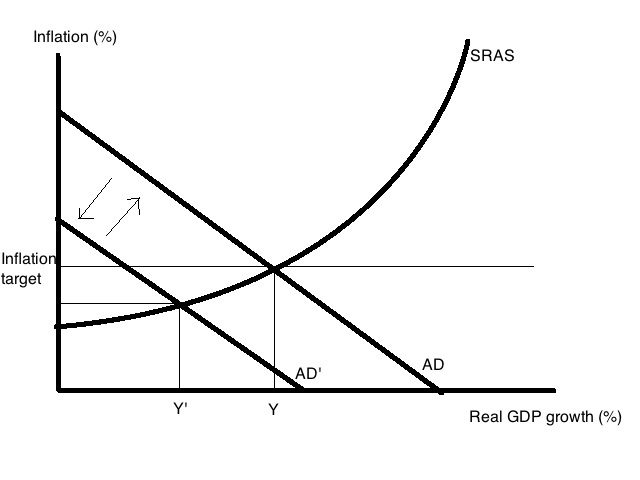 My preferred textbook version of the AS-AD model is a model similar to the one Tyler Cowen and Alex Tabarrok use in their great textbook Modern Principles of Economics where the model is expressed in growth rates (real GDP growth and inflation) rather than in levels. It is obvious that the demonstrations and unrest in Istanbul are likely to lead to disruptions in production – roads are closed down, damages to infrastructure, some workers are not coming to work and even some lines of communication might be negatively impacted by the unrest. Compared to the entire Turkish economy the impact these effects is likely quite small, but it is nonetheless a negative supply shock. These shocks are, however, also likely to be temporary – short-term – rather than permanent. Hence, this is a short-run AS shock. I have illustrated that in the graph below. This is the well-known illustration of a negative short-run supply shock – inflation increases (from P to P’) and real GDP growth declines (from Y to Y’). This might very well be what we will see in Turkey in the very short run – even though I believe these effects are likely to be quite small in size. However, note that we here assume a “constant” AD curve. Peter is of course right that the implicit assumption is that the money supply (or money base) is constant. The standard IS/LM model suffers from the same problem. A fact that have led me to suggest an alternative ISLM model – the so-called IS/LM+ model in which the central bank’s monetary policy rule is taken into account. Obviously no analysis of macroeconomic shocks should ignore the monetary policy reaction to different shocks. This is obviously something Market Monetarists have stressed again and again when it for example comes to fiscal shocks like the ‘fiscal cliff’ in the US. In the case of Turkey we should therefore take into account that the Turkish central bank (TCMB) officially is targeting 5% inflation. Therefore if the TCMB was targeting headline inflation in a very rigid way (ECB style) it would have to react to the increase in inflation by tightening monetary policy (reducing the money base/supply) until inflation was back at the target. In the graph above that would mean that the AD curve would shift to the left until inflation would have been brought down back to 5%. The result obviously would be a further drop in real GDP growth. In reality I believe that the TCMB would be very unlikely to react to such a short run supply. In fact the TCMB has recently cut interest rates despite the fact that inflation continue to run slightly above the inflation target of 5%. Numbers released today show Turkish headline inflation was at 6.6% in May. In fact I believe that one with some justification can think of Turkish monetary policy as a “flexible NGDP growth targeting” (with horrible communication) where the TCMB effectively is targeting around 10% yearly NGDP growth. Interestingly enough in the Cowen-Tabarrok version of the AS-AD model that would mean that the TCMB would effectively keep the AD curve “unchanged” as the AD curve in reality is based in the equation of exchange (MV=PY). While the Istanbul demonstrations clearly can be seen as a short-run supply shock that is probably not what the markets are really reacting to. Instead it is much more likely the the markets are reacting to fears that the ultimate outcome of the demonstrations could lead to lower long-run real GDP growth. 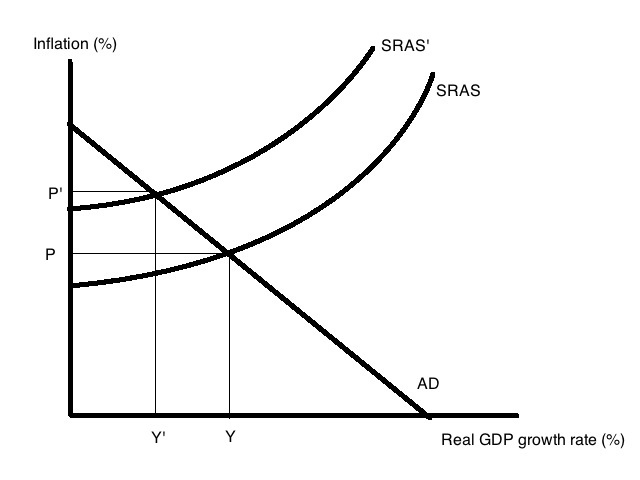 Cowen and Tabarrok basically think of long-run growth within a Solow growth model. Hence, there are overall three drivers of growth in the long run – labour forces growth, an increase in the capital stock and higher total factor productivity (TFP – think of that as “knowledge”/technology). I believe that the most relevant channel for affecting long-run growth in the case of the demonstrations is the impact on investments in Turkey which likely will influence both the size of the capital stock and TFP negatively. I think this is pretty telling about the fears that investors might have about the situation in Turkey. It might be that the Turkish government is not loved by investors, but investors are clearly uncertain about what would follow if the demonstrations led to “regime change” in Turkey and a new government. Furthermore, the main opposition party – the CHP – is hardly seen as reformist. And even if the AKP does remain in power the increased public disconnect could lead to ‘disruptions of production’ (broadly speaking) again and again in the future. Furthermore, the government hard-handed reaction to the demonstrations might also “complicate” Turkey’s relationship to both the EU and the US – something which likely also will weigh on foreign direct investments into Turkey. Hence, regime uncertainty therefore is likely to reduce the long-run growth in the Turkish economy. Obviously it is hard to estimate the scale such effects, but at least judging from the sharp drop in the Turkish stock market today the negative long-run supply shock is sizable. I have illustrated such a negative long-run supply shock in the graph below. The result is the same as in the short-run model – a negative supply shock reduces real GDP growth and increases inflation. However, I would stress that the TCMB would likely not in the long run accept a permanent higher rate of inflation and as a result the TCMB therefore sooner or later would have to tighten monetary policy to push down inflation (by shifting the AD curve to the left). This also illustrates that the demonstrations is likely to become a headache for the TCMB management. Is the ‘tourism multiplier’ zero? Above I have primarily described the Istanbul demonstrations as a negative supply shock. However, some might argue that this is also going to lead to a negative demand shock. Hence, Turkey very year has millions of tourists coming to the country and some them will likely stay away this year as a consequence of the unrest. In the Cowen- Tabarrok formulation of the AD curve a negative shock to tourism would effectively be a negative shock to money velocity. This obviously would shift the AD curve to the left – as illustrated in the graph below. 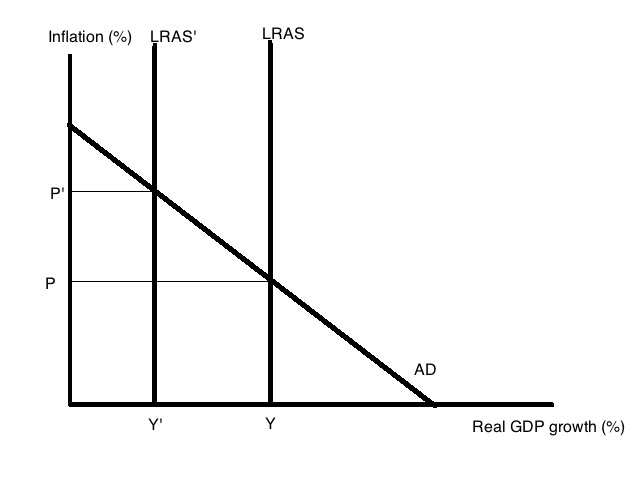 Hence, we initially get a drop in both inflation and real GDP growth as the AD curve shifts left. However, we should never forget to think about the central bank’s reaction to a negative AD shock. Hence, whether the TCMB is targeting inflation or some kind of NGDP growth target it would “automatically” react to the drop in aggregate demand by easing monetary policy. In the case the TCMB is targeting inflation it would ease monetary policy until the AD curve has shifted back and the inflation rate is back at the inflation target. This effectively means that a negative shock to Turkish tourism should not be expected to have an negative impact on aggregate demand in Turkey for long. This effectively is a variation of the Sumner Critique – this time, however, it is not the budget multiplier, which is zero, but rather the ‘tourism multiplier’. Hence, from a macroeconomic perspective the demonstrations are unlikely to have any major negative impact on aggregate demand as we would expect the TCMB to offset any such negative shock by easing monetary policy. That, however, does not mean that a negative shock to tourism will not impact the Turkish financial markets. Hence, there will be a change in the composition of aggregate demand – less tourism “exports” and more domestic demand. This likely is bad news for the Turkish lira. I hope that my discussion above have demonstrated that the AS-AD framework can be a very useful tool when analyzing real world problems – such as the present public unrest in Turkey. Obviously Peter Dorman is right – we should know the limitations of the AS-AD model and we should particularly be aware what kind of monetary policy reaction there will be to different shocks. But if we take that into account I believe the textbook (the Cowen-Tabarrok textbook) version of the AS-AD model is a quite useful tool. In fact it is a tool that I use every single day both when I produce research in my day-job or talk to clients about such ‘events’ as the Turkish demonstrations. Furthermore, I would add that I could have done the same kind of analysis in a DSGE framework, but I doubt that my readers would have enjoyed looking at a lot of equations and a DSGE model would likely have reveal little more about the real world than the version of the AS-AD model I have presented above. PS Please also take a look at this paper in which I discuss the politics and economics of the present Turkish crisis. PPS Paul Krugman, Nick Rowe and Mark Thoma also comment on the usefulness of the AS-AD framework. Still not seeing much discussion of 4.1% unemployment rate in Japan, would love to see “jump start” defined. What Tyler is basically saying is that there really is not an argument for “jump starting” the Japanese economy with fiscal and monetary stimulus when unemployment is this low. I many ways I share Tyler’s skepticism about “stimulus” in the case of Japan. Hence, Japan came out of the crisis from 2001. However, it should also be noted that Japan has once again fallen into crisis and more importantly Japan’s monetary policy certainly is not based on a rule based framework so the risk that Japan will continue to fall back into crisis remains high. This in my view is a discussion about securing Japan a “Monetary constitution” rather than about stimulus. Unfortunately Prime Minister Abe’s new government do seem to be more focused on short-term stimulus rather than on real institutional reform. The Abe government is not only pursuing expansionary monetary policies, but has also announced that it wants to ease fiscal policy dramatically. This obviously will scare any Market Monetarist – or anybody who are simply able to realise that there is a budget constrain that any government will have to fulfill in the long-run. Furthermore, it is clear that Japan’s extremely weak fiscal position to a large extent can be explained by the fact that BoJ de facto has been targeting 0% NGDP growth rather than for example 3% or 5% NGDP growth. I basically don’t think that there is a problem with a 0% NGDP growth path target if you start out with a totally unleveraged economy – one can hardly say Japan did that. The problem is that BoJ changed its de facto NGDP target during the 1990s. As a result public debt ratios exploded. This is similar to what we see in Europe today. So yes, it is obvious that Japan can’t not afford “fiscal stimulus” – as it today is the case for the euro zone countries. But that discussion in my view is totally irrelevant! As I recently argued, there is no such thing as fiscal policy in the sense Keynesians claim. Only monetary policy can impact nominal spending and I strongly believe that fiscal policy has very little impact on the Japanese growth pattern over the last two decades. Above I have basically added nothing new to the discussion about Japan’s lost decade (not decades!) and fiscal and monetary policy in Japan, but since Scott brought up the issue I thought it was an opportunity to remind my readers (including Scott) that I think that the Japanese story is pretty simple, but also that it is wrong that we keep on talking about Japan’s lost decades. The Japanese story tells us basically nothing new about fiscal policy (but reminds us that debt ratios explode when NGDP drops), but the experience shows that monetary policy is terribly important. My advise to the Abe government would therefore be for the Bank of Japan to introduce proper monetary policy rules and I think that an NGDP level targeting rule targeting a growth path of 3% would be suiting for Japan given the negative demographic outlook for Japan. Furthermore, if the BoJ where to provide a proper framework for nominal stability then the Japanese government should begin a gradual process of fiscal consolidation by as soon as possible to bring the Japanese budget deficit back to balance. With an NGDP growth path of 3% Japanese public debt as a share of GDP would gradually decline in an orderly fashion on such fiscal-monetary framework. So what Japan needs is not “stimulus” – neither fiscal nor monetary – but rather strict rules both for monetary policy and fiscal policy. The Abe government has the power to ensure that, but I am not optimistic that that will happen. PS even though I am skeptical about the way Shinzo Abe are going about things and I would have much preferred a rule based framework for Japan’s monetary and fiscal policy I nonetheless believe that the Abe government’s push for particularly monetary “stimulus” is likely to spur Japanese growth and is very likely to be good news for a global economy badly in need of higher growth. “The US is currently engaged in the largest peacetime fiscal stimulus in history, with a budget deficit of around 10 percent of GDP. And this stimulus is working in the narrow sense that it has headed off the imminent risk of a deflationary spiral, and generated some economic growth. On the other hand, deficits this size cannot be continued over the long haul; USA now has Italian (or Belgian) levels of internal debt, together with large implicit liabilities associated with its awkward demographics. So the current strategy can work in the larger sense only if it succeeds in jump-starting the economy, in eventually generating a self-sustaining recovery that persists even after the stimulus is phased out. Wauw! What is this? What happened to the keynesian Krugman? Isn’t he calling for fiscal easing anymore? Well yes, but I am cheating here. This is Paul Krugman, but it is not today’s Paul Krugman. This is Paul Krugman in 1999 – and he is talking about Japan and not the US. I simply replaced “Japan” with “the US” in the Krugman quote above. HT Tyler Cowen and Vaidas Urba. Tyler Cowen and Alex Tabarrok have written one of the best economics textbooks out there and now they are introducing the Marginal Revolution University. You can visit http://www.MRUniversity.com here. There you can sign up for information about our first course, Development Economics, which is described by Alex below. I think this is a great idea and a very good opportunity for students of economics and amateur economists to get high quality economic education from some of the best and most clever guys out there. So I encourage everybody just remotely interested in economics to sign up NOW. 1. There is a widespread belief that inflation helped cause the initial mess (not to mention centuries of other macroeconomic problems, plus the problems from the 1970s, plus the collapse of Zimbabwe), and that therefore inflation cannot be part of a preferred solution. It feels like a move in the wrong direction, and like an affiliation with ideas that are dangerous. I recall being fourteen years of age, being lectured about Andrew Dickson White’s work on assignats in Revolutionary France, and being bored because I already had heard the story. 2. There is a widespread belief that we have beat a lot of problems by “getting tough” with them. Reagan got tough with the Soviet Union, soon enough we need to get tough with government spending, and perhaps therefore we also need to be “tough on inflation.” The “turning on the spigot” metaphor feels like a move in the wrong direction. Tough guys turn off spigots. 3. There is a widespread belief that central bank discretion always will be abused (by no means is this view totally implausible). “Expansionary” monetary policy feels “more discretionary” than does “tight” monetary policy. Run those two words through your mind: “expansionary,” and “tight.” Which one sounds and feels more like “discretion”? To ask such a question is to answer it. Even though I like Tyler’s explanations to his question I think there is one big problem with his comment and that is his premise that Market Monetarists are advocating “expansionary” monetary policy. We are not – at least I am not and I don’t think Scott Sumner is. I have again and again argued that NGDP level targeting is not about “stimulus” and it is certainly not discretionary. Rather NGDP level targeting is about ensuring that monetary policy is “neutral” and does not distort the price system. As I have earlier argued that if the central bank is pursuing a policy of NGDP level targeting then (ideally) relatively prices would be unaffected by monetary policy and hence be equal to what they would have been in a pure barter economy. Hence, what we line with George Selgin are arguing is the true Free Market alternative to the present monetary policy in for example the euro zone and the US. Contrary to for example the Taylor rule which anybody who has studied David Eagle or George Selgin would tell you is leading to distortions of relative prices. How can any conservative or libertarian advocate a monetary policy rule which distorts market prices? But why do people get confused and think we want monetary stimulus? Well, it is probably partly our own fault because we argue that the present crisis particularly in the US and Europe is due to overly tight monetary policy and as a natural consequence we seem to be favouring “expansionary” monetary policy or “monetary stimulus”. However, the point is that we argue that the ECB and Fed failed in 2008 and to a large extent have continued to fail ever since and that they need to undo their mistakes. But we mostly want the central bank to stop distorting relative prices and we would really just like to have a big nice “computer” called The Market to take care of the implementation of monetary policy. That is also what Milton Friedman favoured and what right-winger would be against that? PS I assume that Tyler uses the term “right-winger” to mean somebody who is in favour of free markets. That is at least how I here use the term. In a recent post I commented on Tyler Cowen’s reservations about the gold standard on his excellent blog Marginal Revolution. In my comment I invited to dialogue between Market Monetarists and gold standard proponents and to a general discussion of commodity standards. I am happy that Blake Johnson has answered my call and written a today’s guest blog in which he discusses Tyler’s reservations about the gold standard. Obviously I do not agree with everything that my guest bloggers write and that is also the case with Blake’s excellent guest blog. However, I think Blake is making some very valid points about the gold standard and commodity standards and I think that it is important that we continue to discuss the validity of different monetary institutions – including commodity based monetary systems – even though I would not “push the button” if I had the option to reintroduce the gold standard (I am indirectly quoting Tyler here). Blake, thank you very much for contributing to my blog and I look forward to have you back another time. I have been reading Marginal Revolution for several years now, and genuinely find it to be one of the more interesting and insightful blogs out there. Tyler Cowen’s prolific blogging covers a massive range of topics, and he is so well read that he has something interesting to say about almost anything. That is why I was surprised when I saw Tyler’s most recent post on the gold standard. I think Tyler makes some claims based on some puzzling assumptions. I’d like to respond here to Cowen’s criticism of the gold standard, as well as one or two of Lars’ points in his own response to Cowen. I am surprised that Cowen would call this the most fundamental argument against the gold standard. First, regular readers of the Market Monetarist are likely very familiar with Selgin’s excellent piece “Less than Zero” which Lars is very fond of. There is plenty of evidence that suggests that there is nothing necessarily harmful about deflation. Cowen’s blanket statement of the harmful effects of deflation neglects the fact that it matters very much why the price level is falling/the real price of gold is going up. The real price of gold could increase for many reasons. If the deflation is the result of a monetary disequilibrium, i.e. an excess demand for money, then it will indeed have the kind of negative consequences Cowen suggests. However, the purchasing power of gold (PPG) will also increase as the rest of the economy becomes more productive. An ounce of gold will purchase more goods if per unit costs of other goods are falling from technological improvements. This kind of deflation, far from being harmful, is actually the most efficient way for the price system to convey information about the relative scarcity of goods. Cowen’s claim likely refers to the deflation that turned what may have been a very mild recession in the late 1920’s into the Great Depression. The question then is whether or not this deflation was a necessary result of the gold standard. Douglas Irwin’s recent paper “Did France cause the Great Depression” suggests that the deflation from 1928-1932 was largely the result of the actions of the US and French central banks, namely that they sterilized gold inflows and allowed their cover ratios to balloon to ludicrous levels. Thus, central bankers were not “playing by the rules” of the gold standard. Personally, I see this more as an indictment of central bank policy than of the gold standard. Peter Temin has claimed that the asymmetry in the ability of central banks to interfere with the price specie flow mechanism was the fundamental flaw in the inter-war gold standard. Central banks that wanted to inflate were eventually constrained by the process of adverse clearings when they attempted to cause the supply of their particular currency exceed the demand for that currency. However, because they were funded via taxpayer money, they were insulated from the profit motive that generally caused private banks to economize on gold reserves, and refrain from the kind of deflation that would result from allowing your cover ratio to increase as drastically as the US and French central banks did. Indeed, one does not generally hear the claim that private banks will issue too little currency, the fear of those in opposition to private banks issuing currency is often that they will issue currency ad infinitum and destroy the purchasing power of that currency. I would further point out that if you believe Scott Sumner’s claim that the Fed has failed to supply enough currency, and that there is a monetary disequilibrium at the root of the Great Recession, it seems even more clear that central bankers don’t need the gold standard to help them fail to reach a state of monetary equilibrium. While we obviously haven’t seen anything like the kind of deflation that occurred in the Great Depression, this is partially due to the drastically different inflation expectations between the 1920’s and the 2000’s. The Fed still allowed NGDP to fall well below trend, which I firmly believe has exacerbated the current crisis. Finally, I would dispute the claim that the gold standard has the potential for “radically high inflation”. First, one has to ask the question, radically high compared to what? If one compares it to the era of fiat currency, the argument seems to fall flat on its face rather quickly. In a study by Rolnick and Weber, they found that the average inflation rate for countries during the gold standard to be somewhere between -0.5% and 1%, while the average inflation rate for fiat standards has been somewhere between 6.5% and 8%. That result is even more striking because Rolnick and Weber found this discrepancy even after throwing out all cases of hyperinflation under fiat standards. Perhaps the most fundamental benefit of a gold run is its property of keeping the long run price level relatively stable. I think Cowen makes two mistakes here. First, the forces behind a functioning gold standard are not random. They are the forces of supply and demand that seem to work pretty well in basically every other market. Lawrence H. White’s book “The Theory of Monetary Institutions” has an excellent discussion of the response in both the flow market for gold as well as the market for the stock of monetary gold to changes in the PPG. To go over it here in detail would take far too much space. Second, commodity prices have not been increasing independent of monetary policy; the steady inflation over the last 30 years has had a significant effect on commodity prices. 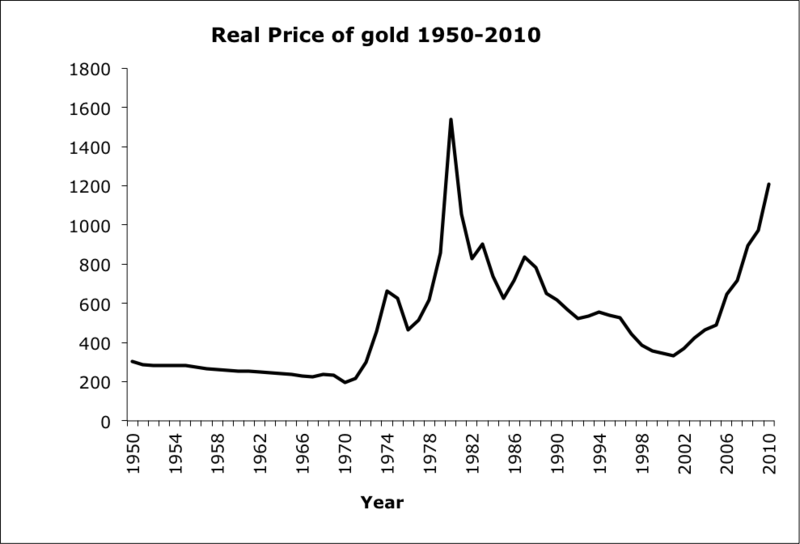 This is rather readily apparent if one looks at a graph of the real price of gold, which is extremely stable and even falling slightly until Nixon closes the Gold Window and ends the Bretton Woods system, at which point it begins fluctuating wildly. Market forces stabilize the purchasing power of the medium of redemption in a commodity standard; this would be true for any commodity standard, it is not something special about gold in particular. This is Cowen’s best point in my opinion. There would indeed be some sizable difficulties in returning from a fiat standard to a gold standard. In particular, it would not be fully effective if only one or two countries returned to a commodity standard, it would need to be part of a broader international movement to have the full positive effects of a commodity standard. Further, the parity at which countries return to the commodity standard would need to be better coordinated than the return to the gold standard in the 1920’s, when some countries returned with the currencies overvalued, and others returned with their currencies undervalued. My main gripe is that Cowen’s claims seemed to be a broad indictment of the gold standard (or commodity standards) in general, rather than on the difficulties of returning to a gold standard today. They are two separate debates, and in my opinion, there is plenty of reason to believe that theoretically the gold standard is the better choice, particularly for lesser-developed countries. 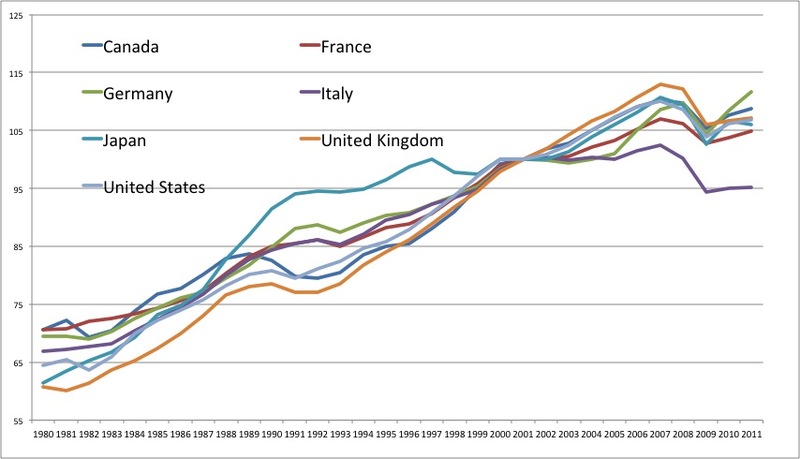 Even for countries such as the US with more advanced countries, the record does not seem so rosy. Central banks not only watched over, but we have reason to believe that their actions (or inaction) have been significant factors in the severity of both the Great Depression and the Great Recession.